Resources in the Concertina Library for H. Crabb and Son. 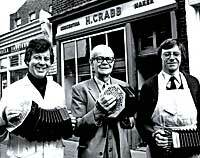 A brief history of Crabb, written in 1978 as the firm neared 150 years in business. Accompanying photographs of the Crabbs and the Islington premises by Bob Naylor. Originally published in Folk News, 1978. Republished with different photographs at Concertina.net. Two pages of manuscript notes written by Neville Crabb c. 1978 as material for Roger Digby to use in writing a brief historical note on Crabb Concertinas. Originally published at Concertina.net. The story of how Roger Digby moved to Islington and found himself buying his first quality instrument from Neville Crabb in 1974. Originally published at Concertina.net. MP3 recordings of Kurt Braun playing his Crane Duet, Crabb #10555, an instrument made in 1950 by Henry Crabb for his own use. Dealer's pricelist from J. J. Vickers listing models and prices for English, Duet, and Anglo concertinas, including instruments made by C. Wheatstone & Co., Lachenal & Co., Jeffries, Jones, Shakespeare, Case, Chidley, Crane, and Crabb. Dated c. 1935 by internal evidence.